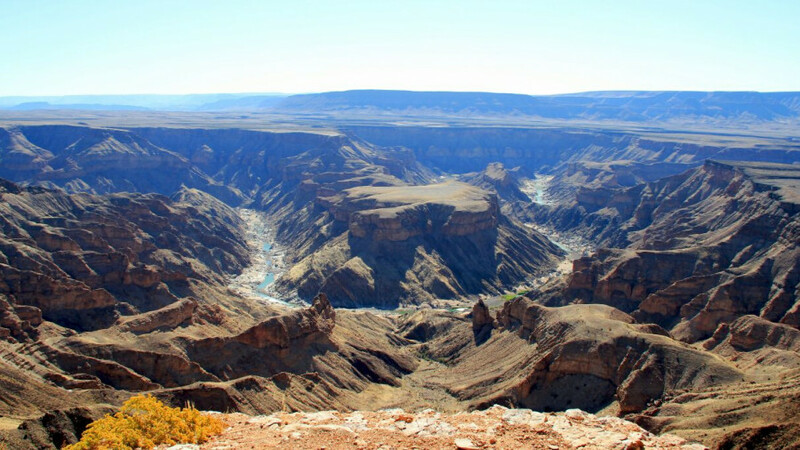 Fish River Lodge is the only lodge situated directly on the edge of Namibia’s Fish River Canyon, the second largest canyon in the world. 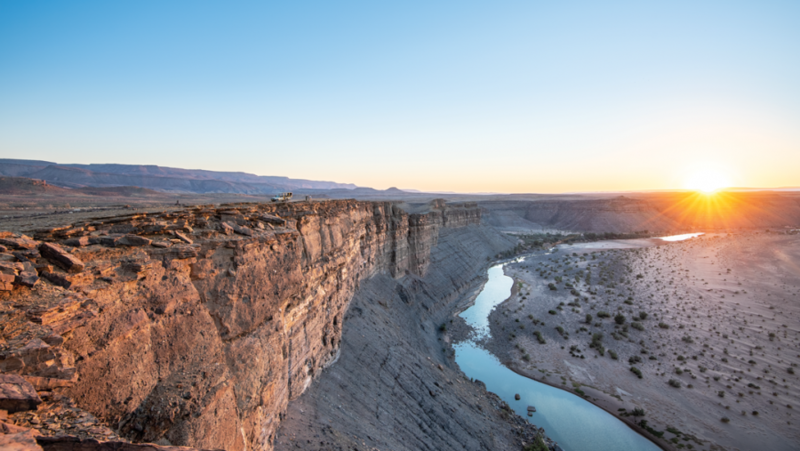 From sunrise to sunset, visitors are treated to breathtaking views of this singular, geographical wonder. The twenty chalets perch on the brink of the canyon, far enough from each other to let guests relish the peaceful landscape. Interiors are kept cool by dry-packed stone walls and large windows that perfectly frame the scenery. The six double and fourteen twin rooms each have a large walk-in pebble stone shower as well as a secluded outside shower. Private decks are perfect for enjoying the view or practising yoga and meditation. The all-round rooftop windows offer you a starry view of the night sky while you drift away to sleep. Double rooms can be converted into family rooms offering extra room for two children. The 45,000 hectare Canyon Nature Park is a natural sanctuary for Karoo succulent flora and endemic wildlife. 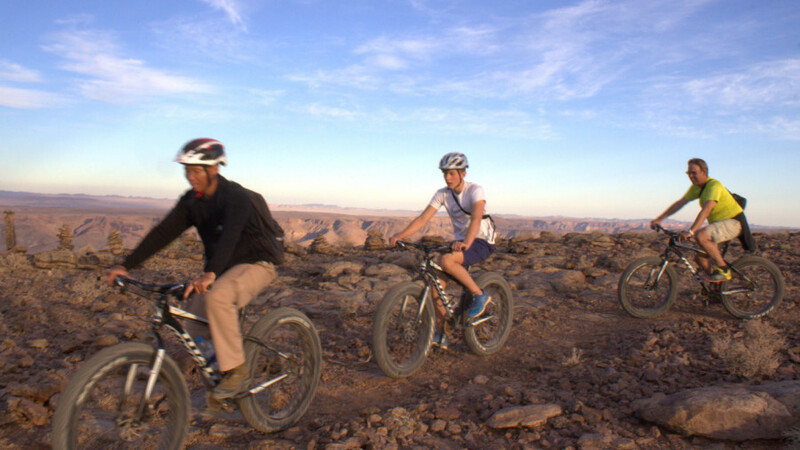 Hiking and cycling trails meander down into the heart of the canyon where permanent water holes and rock pools attract a wide selection of endemic wildlife. Enjoy a massage in the privacy of your room to soothe tired muscles after hiking and exploring the canyon. Still the best way to experience the enormity and beauty of the canyon, is by walking in it during the cooler months of the year. From April to September, hiking enthusiasts can enjoy the variety of hiking packages led by experienced guides. Fortifying meals and refreshing drinks meet hikers at the prepared camps every evening. Cycling is a great way to meander through the landscape at a faster pace. Fat bikes are rugged and make the going easy. 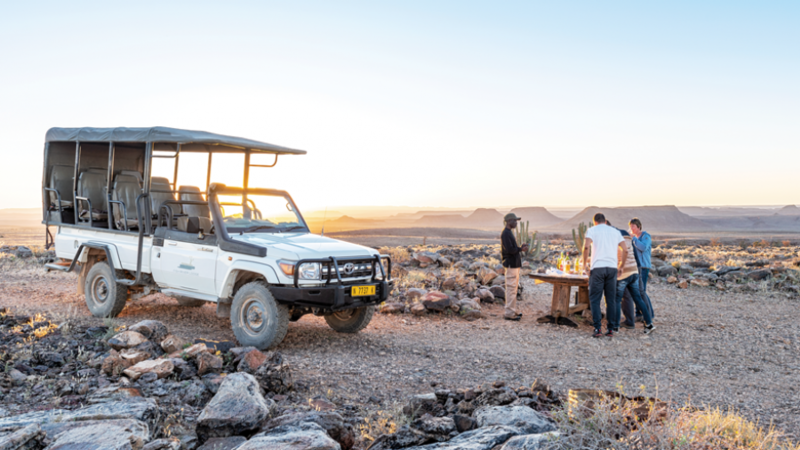 A leisurely way to explore the canyon and its wildlife and flora, is by our tough 4 x 4 vehicles. Scenic drives undertaken during the morning or evening give a glimpse of the natural cycles of this harsh terrain, while full day drives afford a better understanding of the exceptional area and its inhabitants. Experienced guides will reveal the geological features as you journey into the depths of the canyon. Enjoy a prepared lunch and a dip in one of the rock pools to cool off. A truly unforgettable experience, set against a spectacular backdrop. 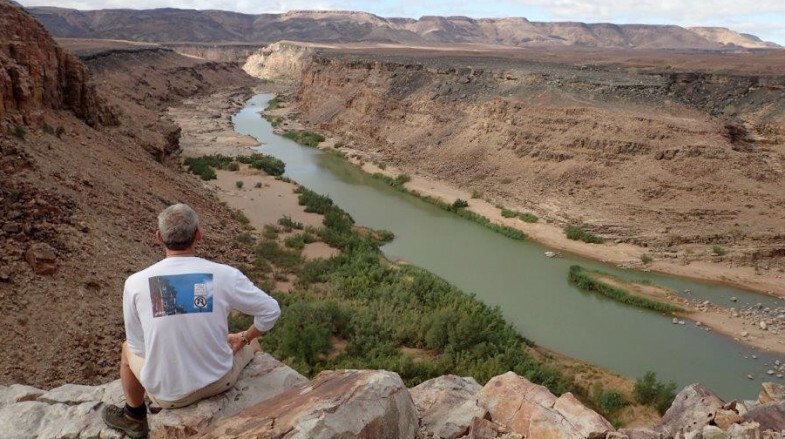 To preserve this amazing part of Namibia, Canyon Nature Park has joined the partnership of the Greater Fish River Canyon Complex, a trans boundary collaboration between parks and conservation agencies and private landowners in the Richtersveld (South Africa), the Huns mountains and /Ais /Ais Game Park, Namibia. The collaboration focuses on a broad-based approach to conservation and sustainable natural resource management and socio-economic development. Whilst we have opted for conventional building materials (given that a previous structure already existed on the site), an environmental scoping study was conducted prior to the construction of the new lodge. A botanist conducted a study on the plants to ensure there would be no impact to rare or protected species and an environmentalist developed an Environmental Management Plan for Canyon Nature Park that included a management plan for the building operations. Guidelines ensure that damage to the environment (including roads) is limited, landscaping and gardening plans are compliant with our biodiversity and general environmental management policies, and water usage is optimised. In addition, waste water is minimised and together with solid waste, disposed of in a designated manger. Power for the Lodge is generated by solar energy. San hunter-gatherers roamed the territory for centuries hunting the great plains animals that once occurred here in large numbers including elephant, rhino and giraffe. 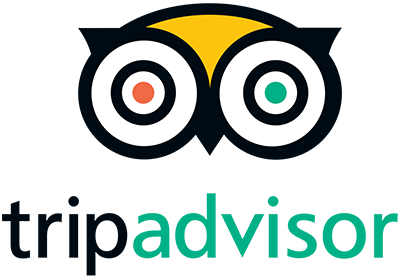 These historical treasures are only open to guests in the company of guides in order to protect them.